Green energy is always a topic of concern. There are currently three types of lighting in the world: traditional incandescent lamps, energy-saving fluorescent lamps and LED lighting. In the market, there are 15 billion traditional incandescent lamps, 3 billion energy-saving fluorescent lamps and 10 million LED lamps. Lighting power consumes 22% of the world's electricity. Incandescent lamps above 60W have been phased out in the EU and the US last year. In fact, many families in China have already been eliminated. However, it is energy-saving fluorescent lamps instead of LED lighting. "From the price point of view, the average incandescent lamp is only 4 yuan, the service life is 400 hours, the energy-saving fluorescent lamp is 20 yuan each, the service life is 6000 hours, the LED lighting is only 400 yuan, and the service life is 45,000 hours." According to Chen Wei, lighting product marketing manager of NXP Semiconductors Greater China, "If you consider energy saving costs and service life together, the overall cost of LED lighting is better than energy-saving fluorescent lamps." Zheng Haowen said that because energy-saving fluorescent lamps are made by many separators, they are also energy-saving fluorescent lamps, and their service life is quite different. "If you use a driver chip to control energy-saving lamps, you can make energy-saving lamps reach the standard life." Ma Sili, president of Global Sources Electronics Business Unit, is more optimistic about LED lighting. He believes that energy-saving fluorescent lamps are only transitional products, from incandescent lamps to LED lighting, the time will not be too long, "five years, the longest ten years!" The author understands that 90% of the products in the lighting market are made in China, and almost all international lighting giants have established research institutions in China. "With LED lighting as an example, in the Pearl River Delta, a complete industrial chain structure will be formed within a few years." Zheng Haowen said. According to Mark A. Saunderson, Shenzhen is located in the heart of the Pearl River Delta, the most active electronics production base in South China. Nearly 4,600 electronics companies have settled here, 26 of which are among the top 100 Chinese electronics OEMs. The output value of thousands of electronic enterprises accounts for 28% of the total output of national electronic products. The income of the electronics industry in Shenzhen alone is as high as 103 billion US dollars, accounting for about 13% of the total output value of the national electronics industry. He predicted that China's electronics exports this year will return to the level of 2008, an increase of 10% compared with 2009. The two-day exhibition organized by Global Sources, 540 booths full, Freescale, Intel, Microsoft, MuellerElectric, NXP and many other well-known domestic and foreign exhibitors, 2 technical forums, 31 vendor technical seminars and 2 markets The supply and demand trend discussion attracted many SME leaders. 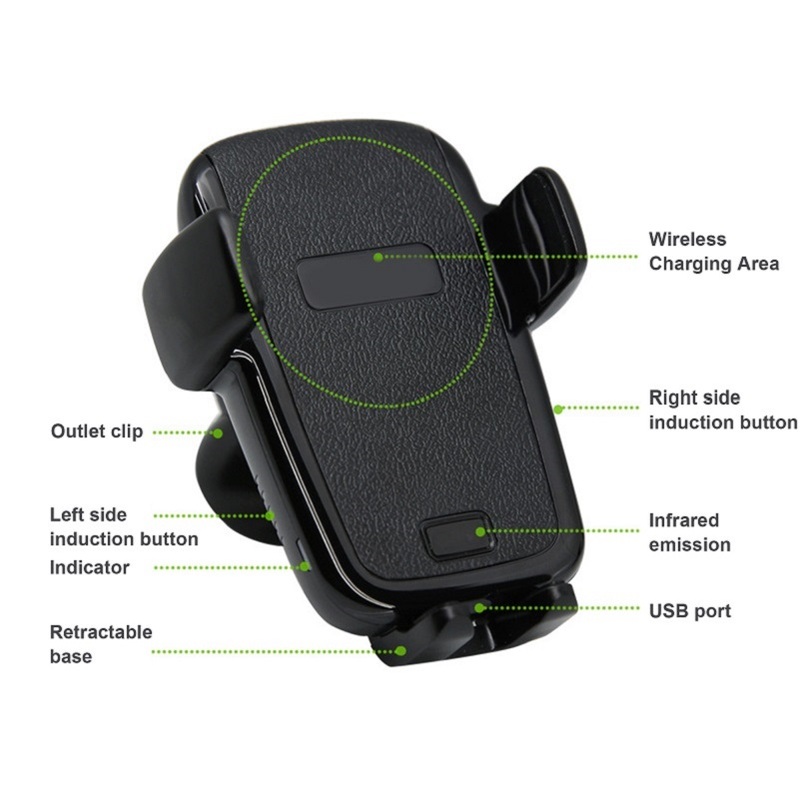 This Fast Wireless Charger, also names Wireless Charger,Wireless Phone Chager,Wireless Charger Pad is universal for Qi Enabled smartphones from 4.0 to 6.2 inches such as Samsung Galaxy S9 / S9 Plus / S8 / S8 Plus / S7 / Note8, iPhone X / 8 / 8 Plus and more(Note: Please don`t put a much thick case, Ring Holder or Pop Sockets on your phone)Compact and lightweight design is convenient to carry while travel around the world.The wirelss charger is an intelligent product for charging,and it`s slightly tilt design ensures you a comfortable viewing angle It is compatible with all devices which are with Qi wireless.Upon classical and elegant design, Wireless Car Charger could bring you much better charging experience as it is more convenient and safe.